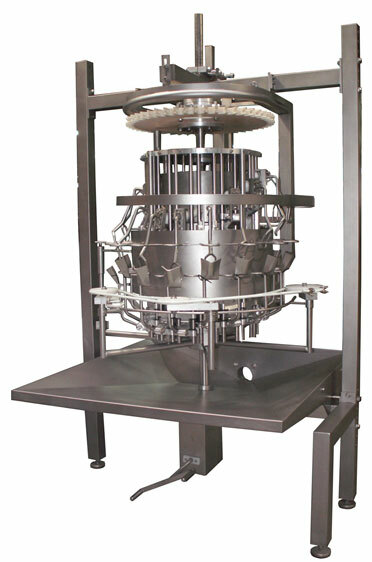 The device is used for automatic removal of internal organs from chickens in the eviscerated-weight range of 1,000 to 2,500g. The device is manufactured with shackle pitch of either 6 inch or 8 inch. Frame made of hollow square section. Main shaft, with a stationary cam drum. Upper and lower support plates are mounted in the upper and lower part of the drum, respectively. Between the upper and lower plates, vertical guide sets are mounted. Each set consists of 2 sliding rods and one slider. The movement of sliders is controlled by a plastic Ø50 wheel, mounted in the back part of the slider. The wheel is guided along the track of the cam drum. The position of the carcass is determined by the guiding rail and the leg guide mounted in the lower part of the main shaft. The guiding rails are mounted on the guide in order to ensure proper entry of chickens into the machine. Drive to the rotating elements of the device is transmitted by a drive wheel mounted underneath the upper transverse beam. Screw elevator for adjusting the height of the main shaft is mounted under the main shaft. Birds enter the device with their backs towards the inside of the machine. Their position is fixed by the foot loop, wing grip and the activated breast plate. The eviscerating spoon is guided along the chicken, along the sternum up to the throat. Then it is turned towards the back part of the chicken and taken out with the viscera. On exiting the device, the viscera are released from the spoon. They will hang loosely, attached to the back part of the chicken.